Clarke & Severn Electronics introduces the new EZ BoardWare SMT spring contacts by Harwin. Also known as grounding/RFI contacts, spring or shield fingers, the new EZ BoardWare SMT spring contacts can be assembled to PCBs and used as grounding or shielding contacts and even for general electrical connections between PCBs. 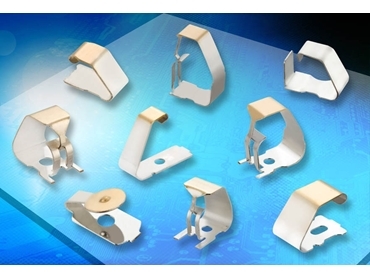 EZ BoardWare SMT spring contacts incorporate features that allow for PCB design flexibility and provide an easy method of connection utilising standard assembly tooling while preventing EMC interference and static. The wide range of sizes and styles allows the use of the spring contacts in applications from consumer and medical devices to test and measure and industrial equipment such as notebooks, mobile phones, patient care equipment, CT scanning, sensors, security systems and GPS.